Athens, Greece is a beautiful city! It is filled with history and yet, in the midst of all that antiquity, thousands of people are living their everyday lives. The city seems to spread out forever with its white buildings piled almost on top of each other. A view from the Acropolis shows a 360° view of buildings virtually as far as the eye can see. This is a city filled with things to see, but you need a plan if you are going to get in as much as possible. If you have a few days in Athens I would recommend that you get a seat on the double decker red tour bus. 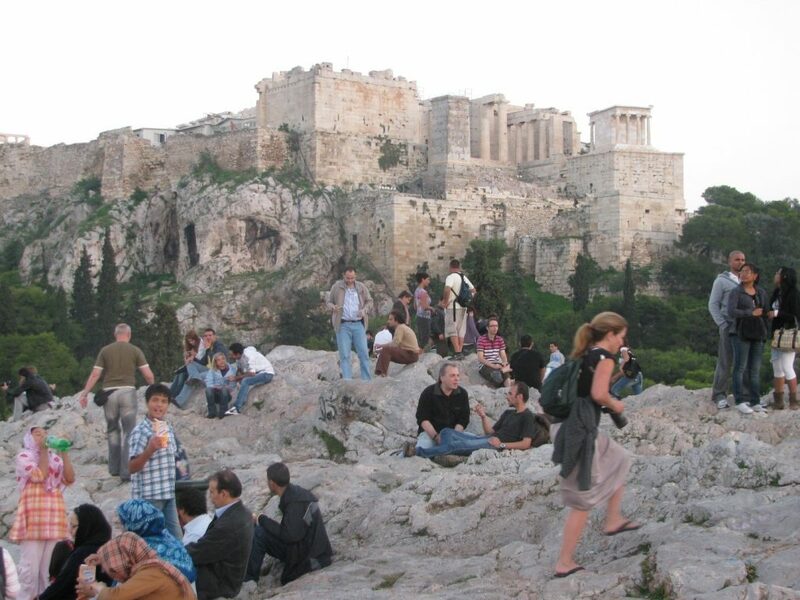 One ticket gives you access to most of the sites in Athens. You can hop on and hop off of the bus at any and every stop. There are buses constantly running, so you do not have to worry about getting stuck at a site. So, get off at the Acropolis stop and walk up the hill. 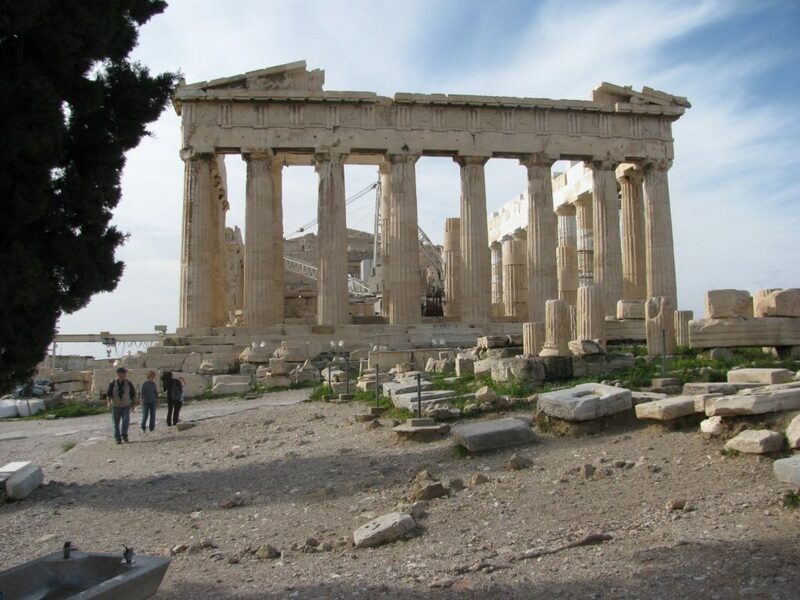 You will need a ticket to get onto the site of the Parthenon, but it is well worth it for the views of the city alone. The entrance to the top of the Acropolis is not an easy climb, so be forewarned that it will take a bit of hiking up some broad stairs to get there. It is worth the climb, do not be intimidated by the stairs, make yourself go all the way to the top. There is no handicap access of which I am aware. Obviously, you want to walk around the Parthenon, taking in all the incredible architecture of this one massive structure. There are other, lesser, wonders at the top. Plan to spend an hour or so around the Parthenon, sometimes I take that much time just shooting photos of the city and the buildings on top. There is a great view to the right of the Parthenon looking down on an ancient Amphitheater that rests against the hill and is still used today for concerts. Back down off the Acropolis is Mars Hill. From Mars Hill you can look down into the ancient Agora or market place of Athens. A plaque at the base of Mars Hill reminds us of its significance in biblical history. This is the place where the Apostle Paul preached his sermon to the citizens of Athens about the unknown God. It is here that the foundation was laid for Athens becoming a Christian city. I am always stopped in my tracks at Mars Hill. I can imagine Paul talking to the elders of Athens, doing his best to convince them that they too ought to become followers of Jesus. It is almost a magical place, full of history as if the rocks still retain the memories of past glories. Like everywhere in this city, do not rush yourself on Mars Hill. Sit down for a few minutes and enjoy the breeze. People watch. Look out over the city. Mars Hill is a great place to catch a sunset if you time your trip right. Even if it is crowded wait a few minutes. People tend to come up, look out, and climb down. Give the crowd time to go and enjoy being on the hill virtually alone. From Mars Hill you can work your way down to the Agora where you can wonder through a church from the 1st Century, a museum that holds antiquities discovered in the area, and look at a massive temple, all as you amble through this wide-open area. Spend some time here reflecting on how bustling it must have been in the Apostle Paul’s day when it was an active marketplace. Work your way around to the other side of the Acropolis and you can walk along marble side streets that are pedestrian only areas. This is the Plaka. This ancient area is now a shopping district for the center of Athens. It contains restaurants, souvenir shops, clothing shops, jewelry stores, everything a modern traveler could want. Just be careful when you go because this is where the cruise ships send their shoppers when they come to town. One of the most amazing things about Athens is that when you are just wondering around you will run into excavation sights that are in the middle of the city without warning. These are some of the best kept gems of the city because you can walk up to the edge of the sights and look into the past. Then, right beside a historic site is a “modern” building. Another thing that always gives me pause is that many of the subway stops in the city are sights filled with antiquities. The subway stop at the Parliament, right in the center of ancient Athens, has a gate from thousands of years ago. There is a cross-section in the wall that shows the different burial customs from different periods of time in the history of Athens. It has pre-Christian graves and early Christian graves as well, and all of this is before you get to the portions of the subway that require you to pay. A free museum along the way in downtown Athens. While you are at the Parliament you should watch the guards, especially if they are changing the guards, it is not quite as impressive as the changing of the guards at Buckingham Palace, but in its understated way it is worth the time out of your day. The guards are dressed as ancient soldiers and are very serious about doing their job of guarding the Parliament. 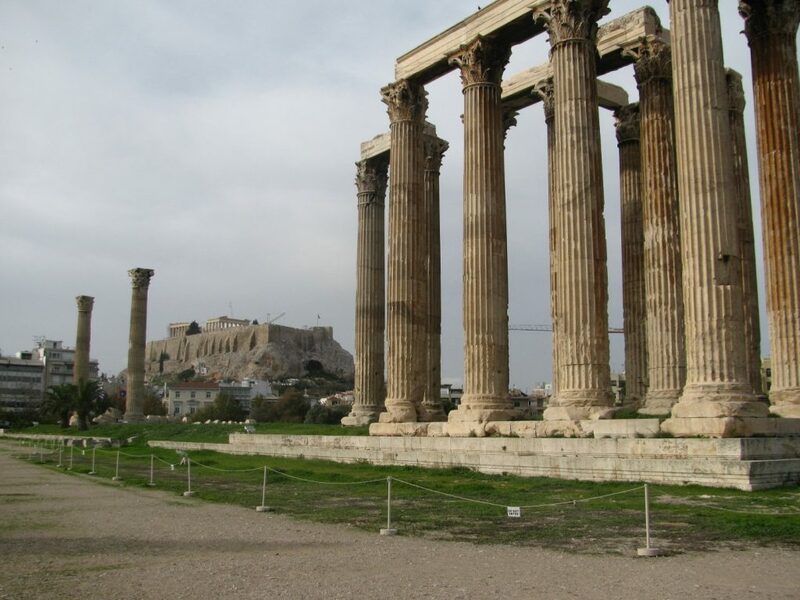 To the right of the Parliament and slightly down the hill is the remains of the Temple of Zeus. Take a few minutes and wonder through this park, you can walk right up to the pillars. At the edge of this park, headed back toward the Acropolis is the Arch of Hadrian. Now Hadrian evidently really traveled a lot. He built a wall in northern England. He built structures in Jerusalem, and he built an arch in Athens. This park runs right beside one of the main roads in downtown Athens, so be careful coming and going. Right across the street from the Arch of Hadrian is the law offices of my good friend Vassilios. Stop in and give him my greetings if you are in the area. This is just a few of the many things to do in Athens. It will take you a good part of the day. 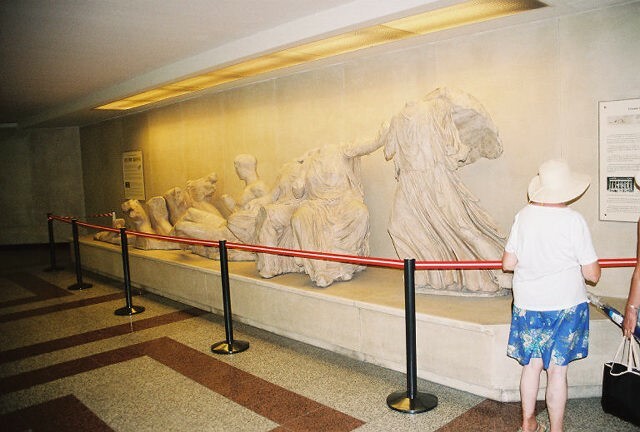 You can also go to the Parthenon Museum just down from the Parthenon, go to the Port of Piraeus, or visit Socrates Prison. Enjoy this city because it is an absolute delight.